We stock a 16’W X 50’L (4’ drop) Tree/Nursery Tarp in black mesh with grommets on the hem and 2 rows of D-rings on all 4 sides. Custom sizes and colors available. 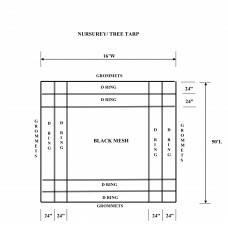 16'W X 50'L Nursery/Tree Tarp, Black Mesh - 4' Drop Tarp. Grommets on the hem, every 24” with 2 row..